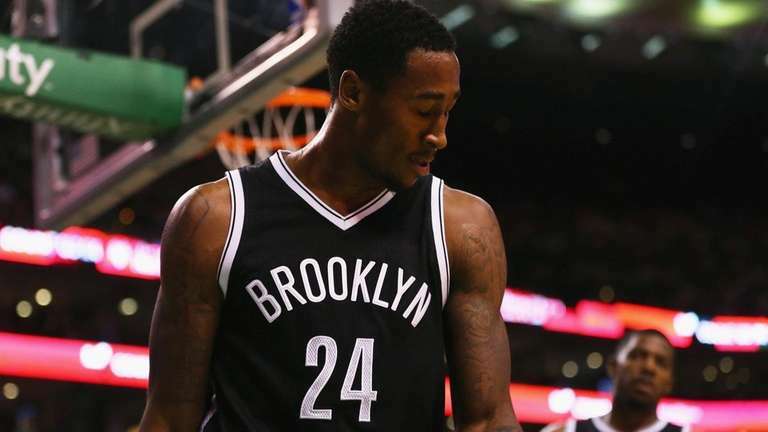 EAST RUTHERFORD, N.J. — In a season already full of demoralizing losses, the Nets were dealt yet another blow Monday morning when it was discovered that Rondae Hollis-Jefferson had fractured his right ankle in practice and will require surgery. Hollis-Jefferson seemed jovial during the open portion of practice, laughing with coach Lionel Hollins, but the rookie swingman quickly got serious when it came to talking about the injury. X-rays of the ankle had come back negative Sunday night, he said, but a CT scan Monday revealed the extent of the damage: a non-displaced fracture of the posterior talus. He wore a hard plastic cast on the leg, and two long metal crutches were stationed nearby. He’s out indefinitely, and a statement released by the team said no timetable will be established until he’s had the surgery. Hollis-Jefferson said he doesn’t know when the team will schedule the procedure but that he believes it will be in the next few days. Hollis-Jefferson is averaging 5.2 points, and his average of 6.1 rebounds is fourth among rookies. He’s played 19 games, averaging 22.1 minutes, and helped anchor the Nets’ defense. Hollins said he can’t predict how Hollis-Jefferson’s absence will affect a team that already is struggling to finish games and hold on to leads. “I don’t know” if the Nets will miss Hollis-Jefferson’s defense, he said. “ predict whether we’re going to be worse or better because he’s out. There’s times when he was here and he wasn’t playing that we were good on defense . . . We’re going to miss his physicality, his size — 6-7 — his ability to go get rebounds, get hands on the ball. Until then, Bogdanovic likely will take Hollis-Jefferson’s spot in the starting lineup. Markel Brown and Wayne Ellington also are options off the bench. The team also can go to Shane Larkin, Hollins said. The Nets’ 5-15 record is among the worst in the NBA, and only the 76ers are keeping them from the Eastern Conference basement. Though the front office has publicly supported its coach, Hollins, ever the realist, said he understands the tenuous nature of the position.